The digital version costs only $4.99. The paperback version retails at $5.99. Discounts are often available! This book is the culmination of the author’s 45+ years of research, organization, preparation, and final publication. 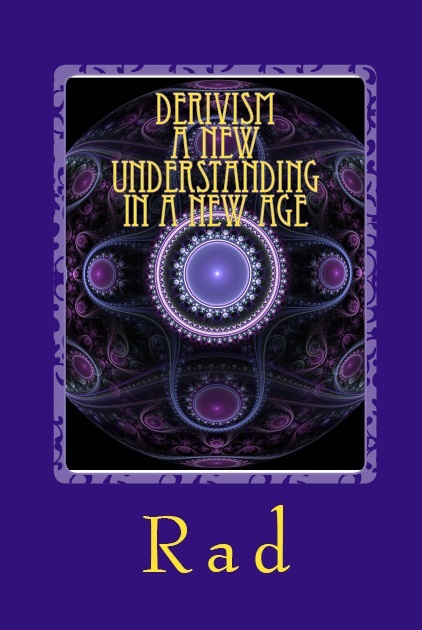 You can contact the author at rad@derivism.com or visit Derivism’s Facebook page. not to be dependent on tradition and second-hand ideals. Would you like for your life to become-- as D. H. Lawrence gently teases above-- a greater thing? Are you ready to grasp the larger meaning of this reality that you perceive? Are you ready to understand God’s true form, and learn how this knowledge affects you? Most importantly, are you willing and able to look beyond a lifetime of cultural conditioning and re-evaluate the most basic of fundamental concepts from a panoramic perspective? Woah! Similar message, but not quite as gentle as D. H. Lawrence, eh? Einstein is usually more mellow in his musings, but he obviously felt strongly about the importance of thinking independently. Welcome to Derivism - A New Understanding in a New Age. Derivism is the truth of the universality of God. It is the understanding that the universe, as a whole, is a living entity, the ultimate and supreme unity that should be understood as God, that can only be God, and from which all other lesser expressions of life are derived. Derivism asserts that the universe, taken as a whole, is a living entity, and that living entity is an omniscient and omnipresent God. God is neither a ‘what’ or a ‘who’; or conversely, God is both a ‘what’ and a ‘who’ and all things else as well. Most accurately (given the limitation of language to symbolically express the concept), God simply is. Many may find that the most difficult part of Derivism to accept is that Derivism does not hinge upon, or concern itself with, the existence of human beings. In fact, the truth of Derivism provides us with the insight that our attempt throughout history to understand God has always suffered from a narcissistic preoccupation with ourselves, and must reach far beyond our self-serving parochial vision. “God is not a He. God is not a She. God is not an It. God is not a pronoun. Derivism teaches us that God is the universe, and the universe is far more than we can ever fully envision. The well-known phrase of conventional theologians that ‘God is everywhere’, as it turns out, is strikingly accurate. God is the omnipotent, omnipresent, omniscient, dynamically collective embodiment of all things and all processes everywhere. To understand the truth of Derivism, one must be prepared to take a greatly expanded look at basic concepts that most of us, unfortunately, have always defined primarily in terms of ourselves. For instance, just what is it that makes something ‘alive’? What is awareness? Consciousness? The broader answers are open to anyone who learns how to view concepts and ideas with a panoramic perspective. You must learn how to understand the universe in terms of itself, because any lesser basis of analysis is fatally flawed from the outset. As one approaches this paradisaical perspective, all other understanding flows ever more effortlessly. Think of this page as Derivism in a nutshell. As you study the implications of Derivism and gain a much greater understanding of basic concepts that you have perceived-- up to now-- in a limited, self-absorbed sense, you will later re-read this page with a profoundly enhanced appreciation of the truths expressed here. If you’ve made it this far, you are possibly open to A New Understanding in a New Age, and probably looking for answers that can be found here. Thank you for your interest and your visit. Hopefully, the truth of Derivism will fundamentally change your understanding of God, and so, inevitably, change your understanding of everything else, including your life, as well.